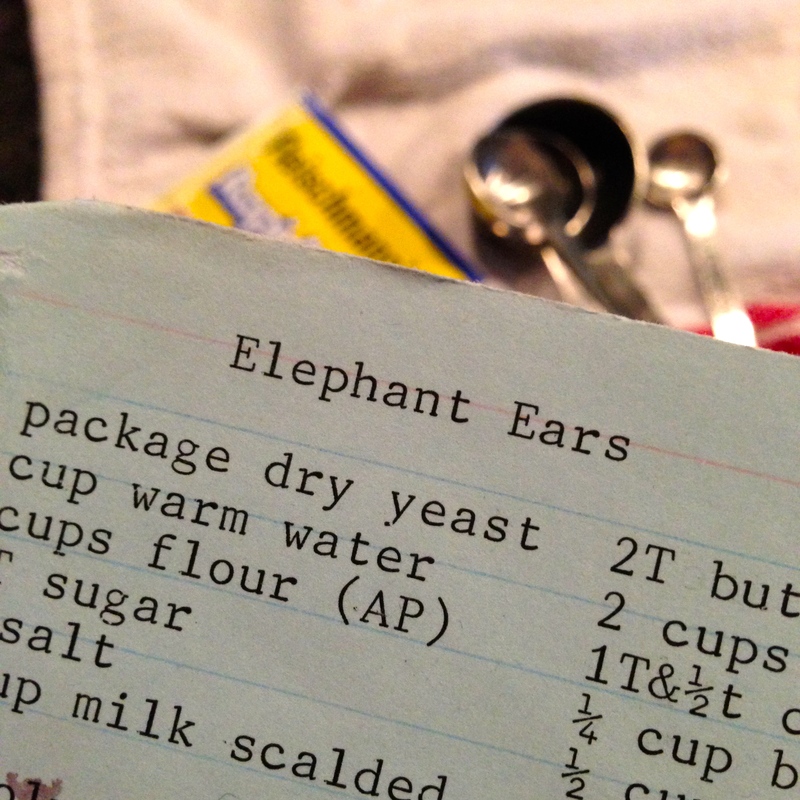 My mom has been baking Elephant Ears for Christmas as long as I can remember. The last many years we’ve made them together as they are time-consuming, messy and everything is much better with a friend. Especially if your friend is your mom and really fun to spend time with. 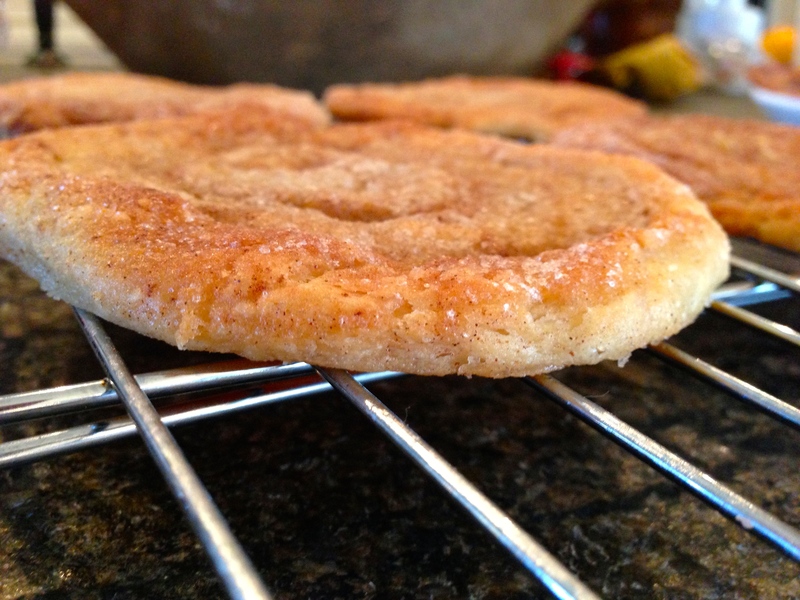 Elephant Ears are thin, crispy on the ends, a tad chewy in the middle, cinnamon and sugar pastries. 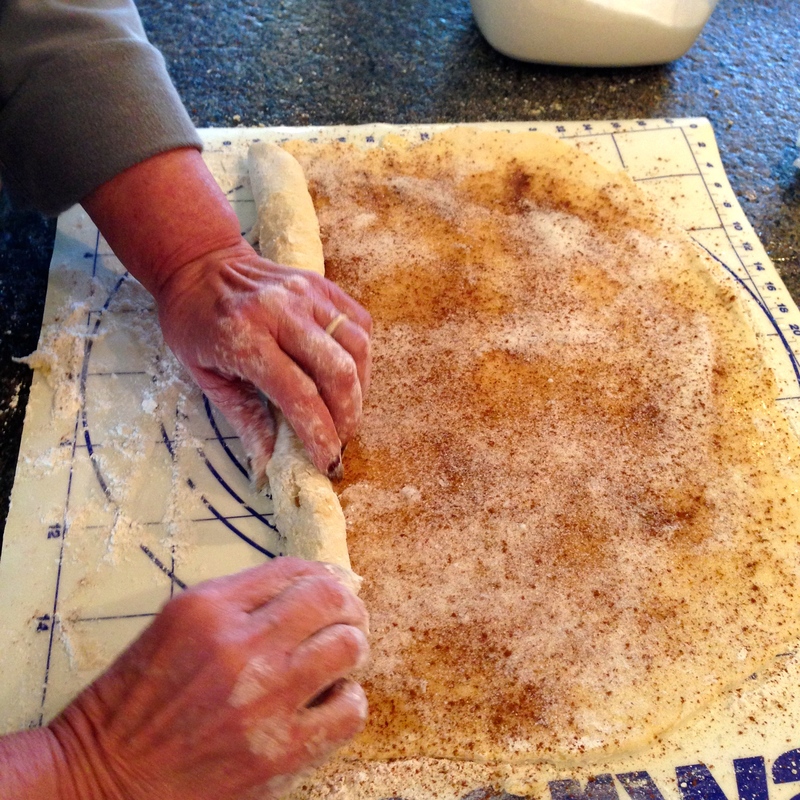 You make them quite like a cinnamon roll but then you press them flat into a mixture of sugar and cinnamon and brush with butter and sprinkle with pecans and more cinnamon and sugar and bake. They fit perfect in a round tin with wax paper to give to those especially special. I believe they were traditionally sold at fairs, but we save them for Christmas. They are easy to make just messy and take a little time and the recipe only makes 18. I know that is three strikes against them but they are so yummy and worth the trouble. My son took his first bite and said, incredible, it’s like heaven and finished it off with a tall glass of cold milk. Our lab got ahold of a ziplock bag full of them two years ago and nearly brought the family to tears as we found the remnants of the ziplock bag in the floor. Jack spent the day outside! Mom used my iPhone to snap a picture of me sprinkling the cinnamon. Can you tell? Not sure how she managed the 15 pictures as she walked around the kitchen. So here is the recipe mom has used for years and years. Dissolve yeast in ¼ cup warm water, let stand for 5 minutes. 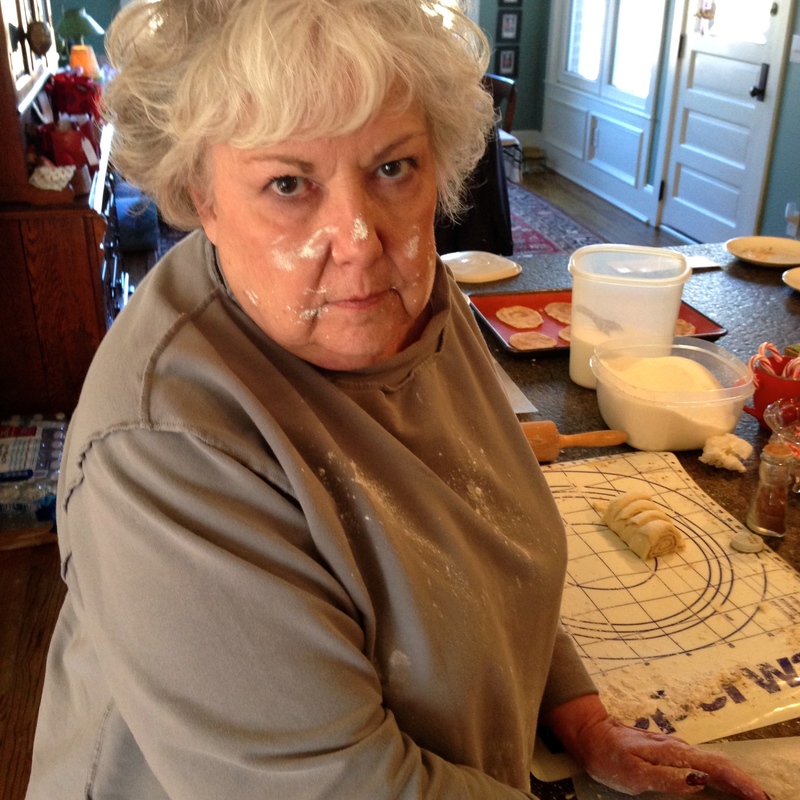 Mix 2 cups flour, 1 1/2 T sugar, ½ t salt in large mixing bowl. Cut in butter with pastry blender until resembles coarse meal. Combine milk, egg yolk and yeast and add to flour mixture, mixing well. Cover with saran wrap tightly directly over dough and chill for 2 hours. After it’s chilled. Turn dough out on a floured surface and knead lightly for 1 or 2 minutes. Cover and let rest for 10 minutes. (Is this necessary? We forgot) Roll out into an 18×10 rectangle on a lightly floured board. Brush with 2 T melted butter. Sprinkle with 1 cup of sugar and sprinkle with cinnamon. We eyeball it. Using I’m sure much more butter. 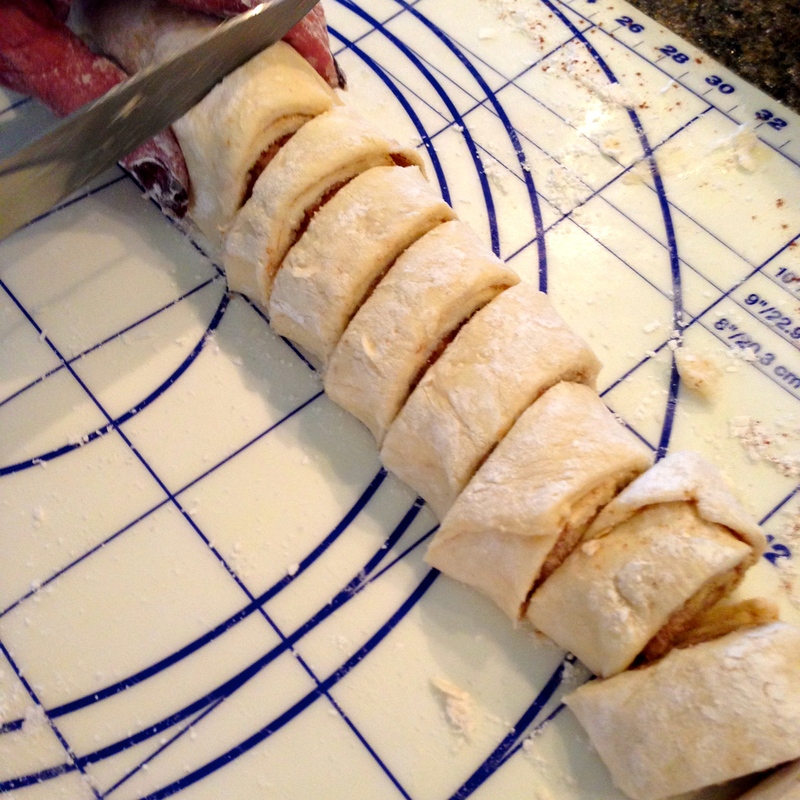 Roll up jelly roll style starting with long side. Cut into 18 1-inch slices. Sprinkle a portion of the remaining sugar/cinnamon mixture on wax paper and place one of the slices on the sugar and press with your fingers to 1/8th inches. Turning over once. Transfer to a cookie sheet lined with parchment paper. Repeat placing them at least an inch apart on cookie sheet. 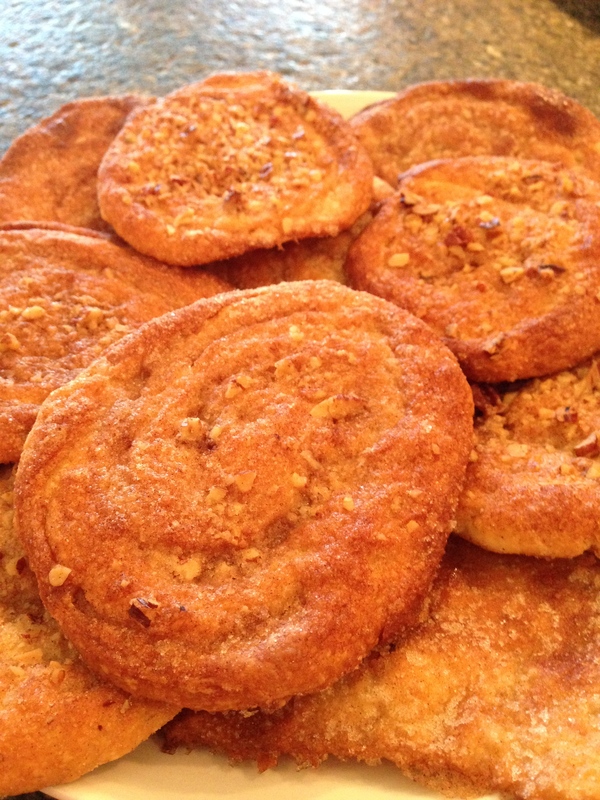 Brush with butter and sprinkle with sugar cinnamon and chopped pecans. Bake 400 for 10 minutes. They need to be lightly browned. Cool a little before transferring to rack. I’ve been eating gluten-free to see if it helps for my migraine so I did try to make one batch gluten-free by using coconut flour and it was a failure. I will need to research flours before trying that again. They had a wonderful flavor but the texture was not good. Jacked scored a few and threw the rest away. I hope if you decide to make them you will let me know how they turn out. Enjoy the baking. 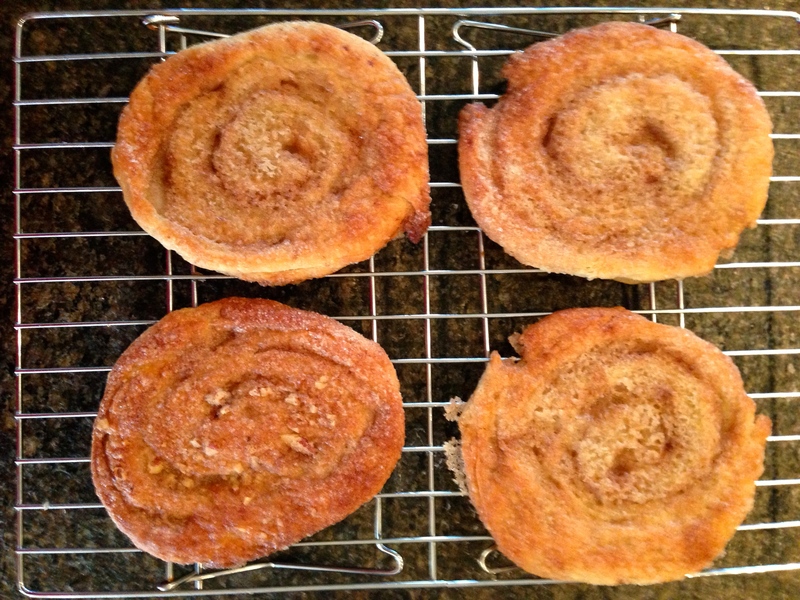 This entry was posted in recipes and tagged baking, cooking, December, elephant ears, recipes by Katey. Bookmark the permalink. Katie those look soooo good! I used to buy at a bakery! May have to try these! Merry Christmas! Aunt Dian looks so much the same as I remember. Though I do see a bit more resemblance to Mona and Yayne than I used to. Must be a mind trick, or really strong Foote genes come as we get older, lol. You don’t look a bit different! Thanks for sharing. I wish I’d been closer to my mom and had these kind of memories. I’m glad you get to enjoy them. so glad I am headed your way tomorrow! love you both!!!!! Mmmmm, I can smell them here! 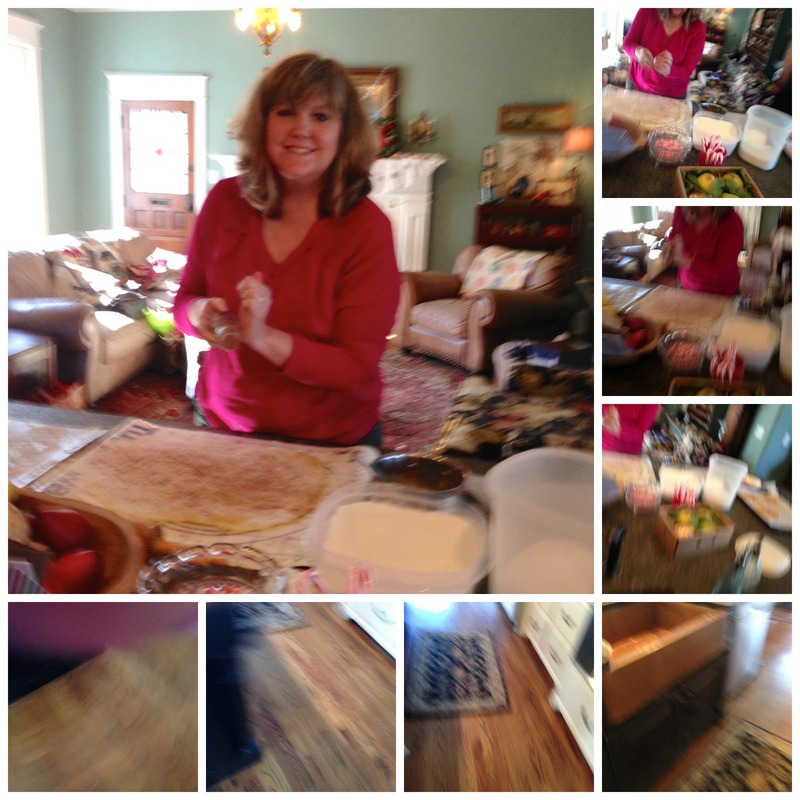 Thanks for taking time to share the recipe and the cute pictures! Keep your dog away too!! They love them!! Have a wonderful Christmas!